Allianz have published their latest report focusing on which risks businesses should be most focused on. We take a look at the highlights and what manufacturers should have on their agenda. Companies increasingly worry about the unpredictable business environment where markets are volatile (#2) and political perils, such as protectionism or terrorism are on the rise. 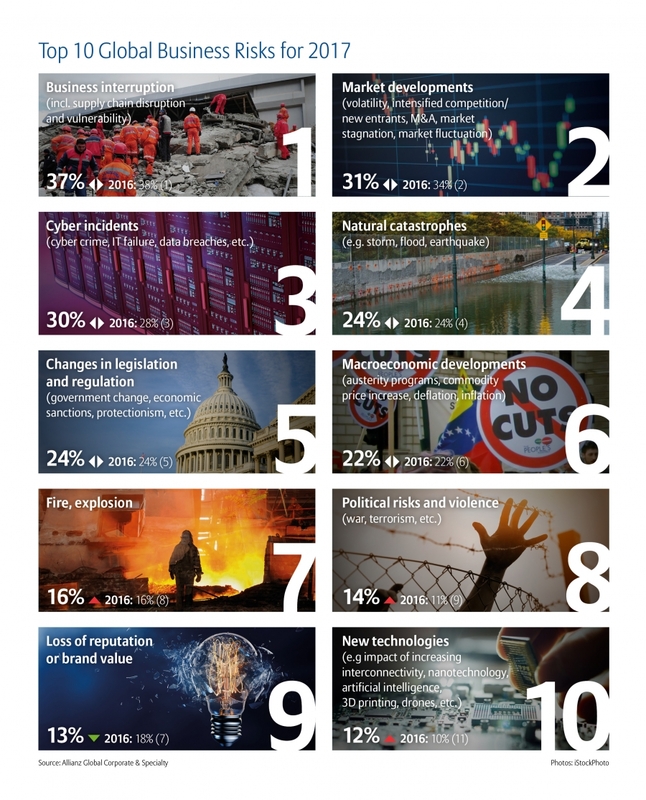 Other growing concerns are digital dilemmas arising from new technologies and cyber risks (#3), as well as natural catastrophes (#4). However, what continues to trouble them most, are losses from business interruption (#1). These are the key findings of the 6th annual Allianz Risk Barometer analyzing corporate risks globally, as well as by region, country, industry and size of business. At the same time, increasing reliance on technology and automation is transforming, and disrupting, companies across all industry sectors. While digitalization is bringing companies new opportunities, it is also shifting the nature of corporate assets from mostly physical to increasingly intangible, bearing new hazards, above all cyber risks (30% of responses). Cyber threats were ranked by comapnies a close #3 globally, climbing to #2 across the Americas and Europe and the top risk in Germany, the Netherlands, South Africa and the UK. At the same time, it is the top concern globally for businesses in the information and telecommunications technology and the retail/wholesale sectors. • Impact of cyber incidents is the top concern for businesses in the UK for the second year in a row.